Built for EVGA Precision X1 - EVGA's all-new tuning utility monitors your graphics card and gives you the power to overclock like a pro! 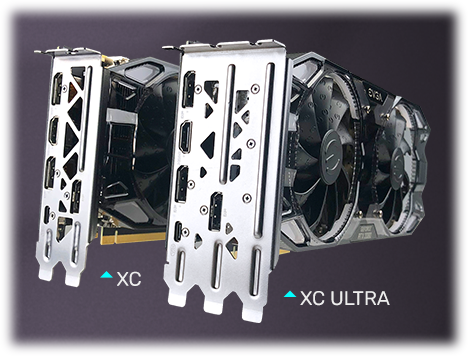 With the EVGA GeForce RTX 20-series Graphics Cards you get the best gaming experience with next generation graphics performance and advanced overclocking features with the all new EVGA Precision X1 software. With the new NVIDIA Turing™GPU architecture and the revolutionary RTX platform, RTX graphics cards bring together real-time ray tracing, artificial intelligence, and programmable shading. This is a whole new way to experience games. 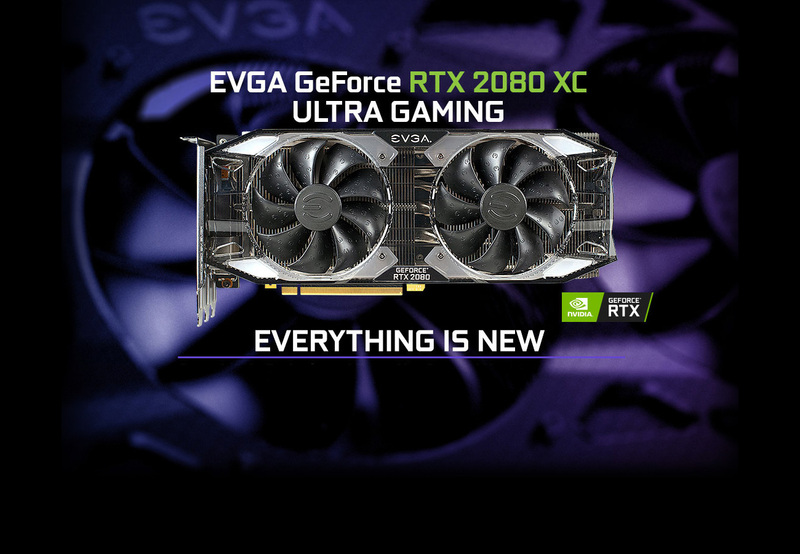 EVGA GeForce RTX 20-Series graphics cards ofer you more ways top keep your system cooler than ever before. Offering a variety of fan choices, heatsink sizes, and cooling technologies. You can select the card that fits your syustem perfectly. 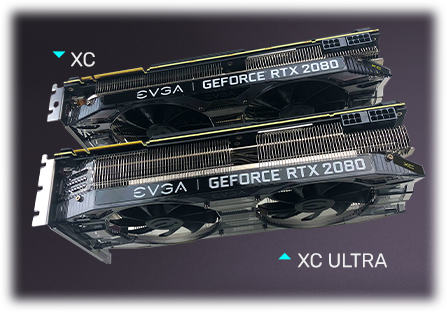 EVGA GeForce RTX 20-Series 2.75 Slot Cards are larger, but allow for better airflow and air pressure. Utilizing a taller fan hub, these fans are specifically designed for the thicker heatsink to apply more force with less noise. Need more space? EVGA GeForce RTX 20-Series 2 Slot Cards give you more space without sacrificing cooling performance or acoustic noise. To make up for the smaller heatsink size, the EVGA GeForce RTX 2 Slot Cards use a smaller fan hub to increase the blade size, which increases airflow and remains quiet. EVGA GeForce RTX 20-Series Graphics Cards feature customizable trim options in black, white, and red to match your PC's theme. Legendary EVGA support to assist 24/7, EVGA Step-Up Program, Forums, Gaming Servers and more to help you game and share. 650-Watt or greater power supply. An available 6-pin PCI-E power connector and an available 8-pin PCI-E power connector. Total Power Draw: 210 Watts. Pros: there is pretty much no game that i've encountered that can't be played at max settings with this bad boy. Cons: the only con is that i didn't spend 700 more for the 2080ti. not really a con though. Other Thoughts: best bang for the buck. 860 bucks for a card that should last a few years is much better than spending 700 more for the 2080ti and having it for the same amount of time as this card. Cons: Price for performance is just not good.. wish I didnt buy it if i could go back id get a 2070 for 250 dollars cheaper for a 13percent less performance. I feel you will need 11GB of Vram very soon for games. Other Thoughts: Overall, Dont waste your money on this get a 2070, 1080ti refurbd or a 2080ti. Stay away from this card dont make the same mistake as I did. While we appreciate your feedback about your EVGA RTX 2080 graphics card. Should you or any potential EVGA customer ever have any questions or concerns with any EVGA product, then I would encourage you to contact our 24 hour Presales Support team by phone 1.888.881.3842 and pressing option 3 or by email: Newegg@EVGA.com so that we can further assist you. Pros: -Triple Slot Cooler is nice if you have the room. -Gaming temps maxed around 65°C after an hour of play AC Origins. Cons: -Price is higher due to larger cooler and slightly higher GPU clock speed. -Not necessarily a con just good to note the reason for the price difference. Other Thoughts: -Pair this with a nice G-Sync monitor like the ASUS ROG Swift PG279Q or similar. -Check out the XC Black edition EVGA part number 08G-P4-2082-KR for a model closer to the RTX 2080 MSRP if you have no problem with a dual slot cooled card; when it is back in stock it is closest to the MSRP for the RTX 2080 series. -Update: Feb-2019 and still going strong! Playing Anthem, The Division 2 Beta and Assassins Creed Odyssey on highest settings with no problems. Great card! Highly recommended. Pros: I wanted a card that would be fast for 1440P gaming, but also be quiet. The EVGA 2080 XC Ultra has a beefy heatsink that lets accomplish both those tasks. It also supports the real time ray tracing, but of course that is only used in a couple games and really isn't a big selling point. I got the card because it was about the same speed as a 1080ti, for about the same price, but with some extra features. You lose a bit of VRAM, but since I'm at 1440P the RAM amount isn't an issue for me. If you do extensive 4K gaming, that might force you to lower texture resolution or other settings a bit. Cons: I also have the clicking fan problem. It only happens when the fans start up, so I ended up using the Precision X1 software to set a minimum fan speed of 30%. It keeps them moving but at an inaudible speed, so now I only get the clicking when I boot up the computer. I don't want to deal with the hassle of an RMA, so I will keep the card. It works great otherwise. Other Thoughts: I really like the card, but am disappointed with my particular sample that has the clicking fan on startup. I think the design is otherwise very good, with good looks, a large heatsink, and quiet operation in all the games I've played so far. I am overall happy with the car, but wish is had been flawless. I have had several EVGA products in the past, and have always had good luck with them, but given the number of complaints about the fans in this one it seems like maybe it was a little rushed and they weren't tuned properly for startup. I would recommend the card with the caveat that you might need to figure out how to deal with the fan noise (RMA hassle or using the software to minimize the occurrence). I would like to thank you for your feedback about your EVGA RTX 2080 graphics card. Should you or any potential EVGA customer ever have any questions or concerns with any EVGA product, then I would encourage you to contact our 24 hour Presales Support team by phone 1.888.881.3842 and pressing option 3 or by email: Newegg@EVGA.com so that we can further assist you. Pros: - Powerful while keeping it cool and quiet. - Ultra version of the card is worth it in my opinion, 65 degres under load. - Excellent customer service from Newegg, one of the fan had a problem and the RMA process as been fast and easy. - Great warranty from Evga and excellent customer service from them too. Cons: - Pricing on RTX cards is still a hard pill to swallow. - Clear shroud is not for every one but evga does provide a free black (or red) trim kit if you register the card wich add a bit to the look. Other Thoughts: Best price/quality RTX 2080 card on the market in my opinion, evga is really a great company to do business with and the little price premium you might pay is worth it in case of a problem. Other Thoughts: - I want to know where can I get my BF5 promotion code! -Yet the US evga site said the code is For residents of the United States or Canada only. 0 out of 19 people found this review helpful. Did you? Unfortunately this is a promotion put on by Nvidia and not by EVGA. 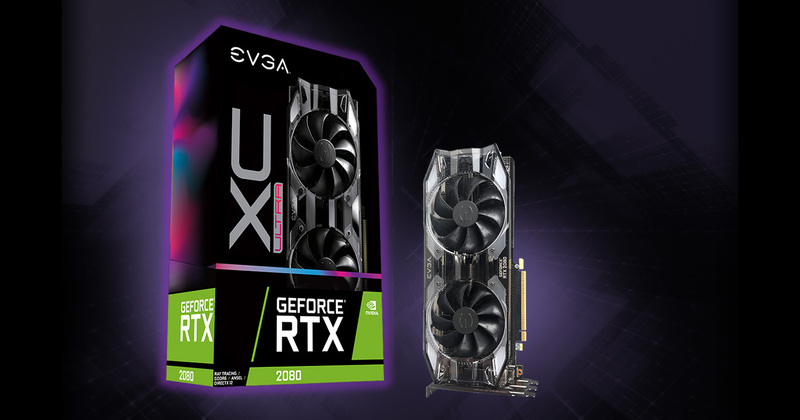 Nvidia had provided the promotional codes to authorized resellers as such it is their responsibility to provide these promo items to their customers who purchase eligible Nvidia Base Video Cards, not necessarily EVGA products. 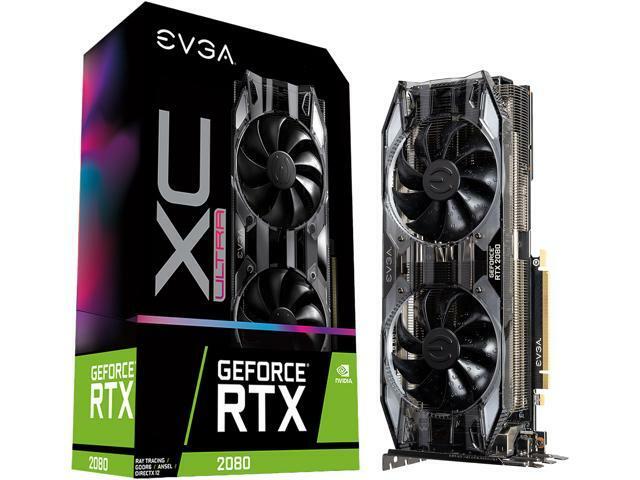 You will need to contact the place of purchase in regards to this promotion as this is something EVGA has no control of if the product was not purchased directly from EVGA's online store. I do apologize for any inconveniences this may cause. Pros: One card is powerful enough to run 4k gaming! Runs cooler than I expected! Cons: It's expensive...but remember just a few years ago we were buying multiple cards to run in SLI for the same price if not more? Other Thoughts: Upgraded from 3-way SLI 780TI SC cards and this is a crazy improvement...One card with more power and capability than 3 cards?!. Would definitely recommend. I'm seeing about 60-70*C with the card running at 100% using the stock cooling.